In 2002, electricians Pete and Christine McAllister knew they had a unique skill set that the town of Cascade and all of Eastern Iowa could greatly use. Together they created McAllister Electrical Services, providing customers with electrical wiring and servicing for agricultural, commercial and residential buildings. Today the company employs five full-time journeymen electricians who are committed to energy-efficiency and electrical safety. McAllister Electrical Services has the ability to lead lighting design in new constructions, retrofit existing structures with energy-efficient LED lighting systems, conduct home electrical inspections, plan and install solar and wind electricity-generating systems, and provide 24/7 electrical repair and service to our customers. 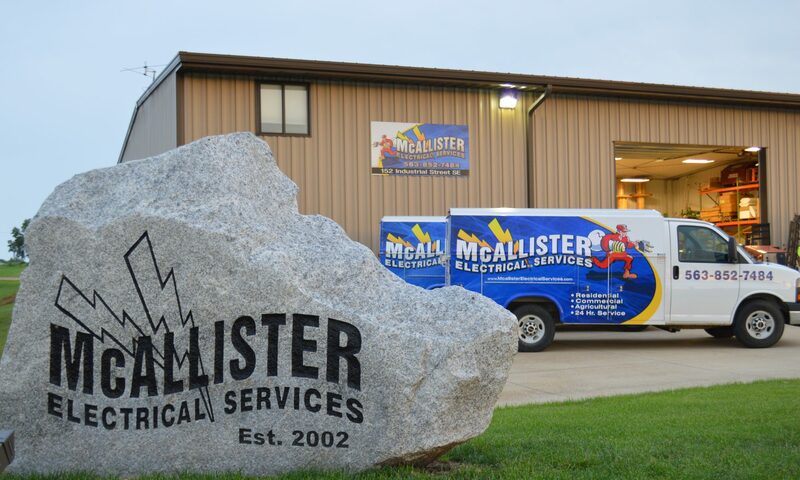 Providing “service that matters,” McAllister Electrical Services has the experience and resources to get the job done right the first time. Member American Builders & Contractors (ABC), Better Business Bureau (BBB) & Cascade Area Chamber of Commerce. Follow MES’ blog, Spark, to receive the latest industry news, updates on some of our projects, and helpful tips and tricks for bringing energy efficiency to your homes and businesses. Peter McAllister, owner of McAllister Electrical Services, always knew that Cascade was the place he would call home. In 2002, Pete saw an opportunity to do just that back in his hometown of Cascade. Many electricians in the area had recently retired, and though the town was small, it housed several small businesses, industrial facilities, farms, and homes that would need someone they could trust to service their electrical needs. For the past 15 years, Bird and his wife, Chris, have grown their company to train and employ dozens of people with McAllister Electrical Services and provide “service that matters” to Cascade and the surrounding communities. Click one of the links below to see some of our featured projects. In this kitchen, McAllister Electric installed can lighting, fixtures above the island, receptacles for appliances, and more. Click the photo above to see more of our residential portfolio. McAllister Electrical Services works closely with Eastern Iowa farmers on their agricultural electricity needs. Click the photo above to see even more of our ag projects. Pictured is the interior of the Autozone store in Dubuque, Iowa. Click the photo for more of the commercial projects McAllister Electrical Services has worked on. McAllister Electrical Services was proud to work on this home gymnasium project. Click above for more fun projects McAllister Electrical Services has had the opportunity to wire.